Time for an old fashioned giveaway. I’ll be sending you Starbucks whole bean coffee, if you win. 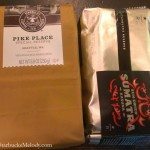 You’ll get one bag of Sun-Dried Sumatra and one bag of Pike Place Special Reserve. 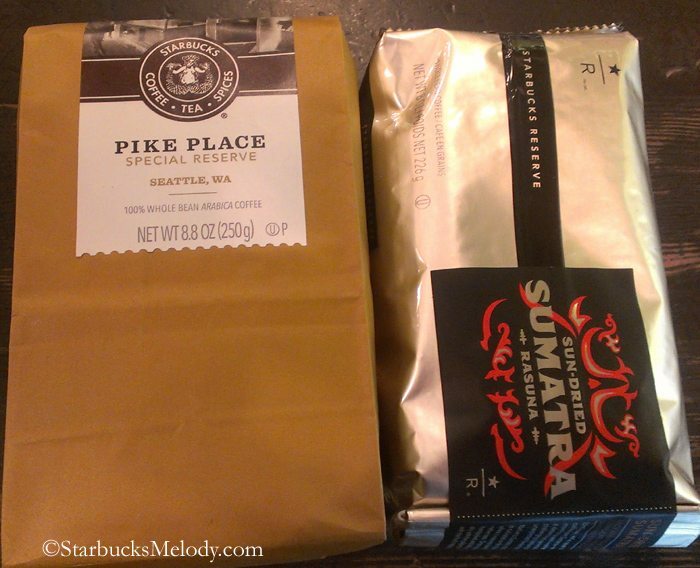 The Pike Place Special Reserve is a coffee blended just Seattle’s Pike Place Market, and can only be purchased at 1912 Pike Place or at the First and Pike Starbucks. 1. Like the blog’s Facebook page. Well, that’s more of a request than a requirement. I realize that many people reading this already have liked it. In addition, there are people who don’t use Facebook! 2. You must leave a comment below. Tell me what hooked you on Starbucks and why. Or tell me what was your first cup of Starbucks coffee, and why it was memorable. 4. All entries must be received before November 2, 2012, at 12:00 p.m., PST. 5. You must be over 18. Void where prohibited by law. 6. Have patience with me. Allow up to a couple of weeks for your prize to get out in the mail. 7. No links in your comments. You can place your blog’s url in the Comment Luv plug in. As an aside, I want to encourage my readers to read about the Starbucks at 1912 Pike Place. It’s a great store. There’s an interview with the store manager here, and an older article about the store here. Enjoy! Good luck winning! I look forward to reading your comments! Giveaway: Tales of the Siren Book and Starbucks Reserve Micro Blend 11. The big Roastery merchandise giveaway. Really like all they stories in this thread. I’m reading these and love all of them despite that I’m replying to only a number of them. Lady Mary, love the American Airlines story. Thank you for the kind words about my blog. It seems as if I am in a Starbucks nearly every day. In fact, I can’t remember when I had my first cup of Starbucks coffee. I am hooked because of the quality taste and the fact that there seems to be a Starbucks in every town I go to. And they are on every street corner. Even the smallest of towns seems to have more than one Starbucks. I blog about museums, so after I visit one I find the nearest Starbucks so I can drink coffee and use the WiFi. Hmmm…Starbucks! I think I had my first cup in the 90’s… Bought a 6-pack sampler and was blown away by the rich taste. I love starbucks. My friends and I used to squat there on weekends b/c we loves the comfy chairs and easy access to caffeine and good tunes. Oooh, the first cup. With a now ex, caramel macchiato. Delicious. Tasted of love. Now simply of happy memories. The first cup of coffee that I fell in love with at Starbucks was Christmas Blend Espresso Roast. Traditionally, I wasn’t a coffee drinker, but having just returned from living in France where for the first time in my life I had had a coffee that I enjoyed (Café au Lait), I decided to give brewed coffee another chance. There were a few misses early on in my Starbucks coffee journey, but it wasn’t until I had Christmas Blend Espresso Roast that I was hooked to coffee. It had such a charming taste that was warm and enveloping. Today, my favourite coffee isn’t actually Christmas Blend Espresso Roast, but actually straight Christmas Blend….a close second followed by Guatemala Antigua, but that might have more to do with having toured several coffee plantations in Guatemala several years back. =) That’s my story! Here ya go Meoldy, My Starbucks Story and why I love the company I work for. I started with Starbucks 6 years ago as a barista for two reasons. All my buddies worked at this specific store and I felt it was a great way for me to work on being more out going. I am, by default, a shy and reserved person but I try hard to be more open and out there. This was the perfect job for that! I made friends with both partners and customers. One such friend, a closing shift lead, used to go to a food/bar type place after work. We’d hang out and unwind. Through that closing shift I met a girl she went to high school with – who also worked at Starbucks! (not my own, we never worked together, because that would be inappropriate). Here was my chance to try talking to a girl, and as a partner, we had common ground to talk about. I never thought it would be anything more because she was so out of my league. Beautiful and outgoing, my opposite. We talked a few times about Starbucks and customers (local stores tend to share a LOT of the same customers) and after a few encounters like this, she suggested we should hang out somewhere beyond the restaurant/bar. I jumped on the chance to ask her on a date. We’ve been married for a year now, together for almost 5 years. Once I was dating this great girl I quickly learned something all young men learn when courting. You need money! At this point, I was asked if I wanted to be a shift supervisor and I jumped on the chance. This was also when my store got a new manager, John, who ended up being my mentor. When I got engaged it became clear that neither of our families could afford a very big wedding. That’s when I decided I would pay for it myself, but I needed to make more money and have more consistent hours. At this point John had transferred to a busier store that was in need of an assistant store manager. I jumped at the opening and told my district manager I wanted to be an assistant store manager and I wanted to work with John. I knew he would be a great teacher for me. I was lucky, and worked hard, and I was able to become an asm for Johns store. After a year of saving I was able to pay for the wedding. My bean stock, free money from Starbucks, paid for the honeymoon trip we took to Ireland. So there I was, over a year ago, an asm and newly married. My wife wanted to have kids sooner rather then later – we’d been together for 5 years now – so I did my best to become a manager. (It didn’t hurt that I had heard about the Texas leadership conference and wanted to make sure I could go to that as well). I worked hard proving that I had what it took to take over my own store and even had the chance to manage a store, temporarily, for 6 months. I did a good job and was given my own store shortly after that. My wife is now 13 weeks pregnant. So for those keeping track – thanks to Starbucks – I became more out going, met a beautiful girl, was able to pay for my own wedding and use my bean stock to have a honeymoon in Ireland. It isn’t all a happy love story that made me such a Starbucks fan. I had the unfortunate experience to be inside a store, as a customer, when something awful happened. I was reading a book and drinking a cup of coffee at my wife’s store. I tend to hang out at my random local stores just because over the years I’ve made so many friends with so many partners. This night, they had a strange customer, but that itself is not weird. We get all kinds of people at Starbucks. Near closing time he walked into the bathroom and a few seconds later we heard a loud crashing sound – as if he had thrown porcelain onto the ground. I was unlucky to be sitting close to the bathroom when I first heard the sound. The partners and myself got close to the bathroom and tried to knock on the door to see if he was okay. I think we all kind of had an idea what that sound really was. One of the partners looked under the doorway, there was a small crack where the door meets the floor, and she could see blood. My wife, the closing shift lead, called 9-1-1 and I called our district manager to let him know something tragic and awful had just happened. It took about 5 minutes for the police to get there, another 5 for my district manager, the store manager, and the regional director to show up. The police got a few statements and told us we could go, but I stuck around with my wife because it was really awful. The part that touched me, what really hit home that this is a company that at its core cares about the partners, was the fact that even though I didn’t work at THAT store and even though I wasn’t on the clock, nor did I ever have to go into that store again – they got us all counseling. My manager, John, called and told me he would get all my shifts covered and all I had to do was let him know when I was ready to go back. Starbucks bent over backwards to make sure all of the partners, myself, my wife and everyone who worked at that store normally (even the ones who weren’t there at the time) would have someone to talk to and make sure we were all okay. There is one more thing that really makes Starbucks an amazing company to work for. The insurance. I am one of those types with a “pre-existing” condition and finding affordable insurance is hard. What I have – Common Variable Immune Deficiency – isn’t as bad as it may seem, but the once a week treatment is pricey. I pay, with my Starbucks insurance, $2,000 a year. After I meet my deductible? My insurance covers the rest. It’s about $50,000 a year that I simply couldn’t afford without insurance. I know that this company cares about the people that work for it, I’ve seen it time and time again, and I also know that we aren’t perfect. We have a lot of stores, a lot of managers, and a lot of areas where mistakes happen. At its core though – Starbucks is a company that wants to treat both the employees and customers as best as possible. I tell people “I love my job because I am paid to make people smile”. TL;DR Starbucks helped me find a girl, marry the girl, have a honeymoon, have a kid(soon), live, deal with an awful situation. Chase, that is an incredible story. Every moment of it. I am almost afraid to ask what happened in the bathroom (don’t answer that! ), but all I can say is that I am glad that Starbucks took care of you. And congrats to you on your family, and baby on the way! I don’t remember my first cup or even when it was, but what sticks out in my mind is how nice everyone always is. I remember heading to grad school one night and stopping at the Starbucks near campus. This was in 2001. I dropped my iced caramel macchiato on the ground when the lid fell off. I went back in and tried to buy another and everyone was so apologetic and made me the drink again for free. I know it’s not easy to have a smile all the time, especially when dealing with customers all day, but I’ve always felt welcome there. When my son was an infant, the baristas were the only adults I talked to all day. They saved me! My first cup of Starbucks was a tall Americano from a store in Yorkville (Toronto) that recently closed. I believe it was the first Starbucks in Toronto – popped up in the mid-90s when I was a student. I had been curious about the fussa so I walked in one day and have been going out of my way for Starbucks ever since. I think what did it for me was the taste. I was used to Tim Horton’s, which were and are ubiquitous in Canada. And I thought the coffee there was good. Until I had that first sip of Americano that is… I recalll thinking: “So this is what coffee is supposed to taste like!” I have avoided Timmy’s whenever possible since then. I also like that Starbucks is not afraid of coffee that tastes like coffee. There are plenty of delicious bold offerings. French Roast quickly became and still remains my favourite coffee in the world. There’s also the fact that Starbucks is always bringing us new ways if enjoying coffee. There’s a Clover machine at a store near work. People don’t get why I make the detour as there are 3 other stores closer to the office. But then I have them taste some rare Clover-brewed offering and if they love coffee, not further discussion is necessary. Last story: one of my best friendhsips developed over a mutual love of Starbucks. There were a bunch of us who were young staffers and liked to go for coffee every now and again together. There was a (bad) Second Cup coffee shop right in our building. We’d vote to see where we would go and the vote was always the same: 4 for Second Cup, 2 for Starbucks (folks didn’t want to have to slog through slush, snow or rain to go for coffee). So finally this person and I just decided to go on our own. It became a routine. We got to know all about one another, she told me about this barista near her place she was falling in love with (they are married now), I told her about my fiancée. We made jokes, resolved work-related problems, discussed new blends, etc. We don’t work in the same office anymore, we see each other socially all the time, but we still regularly take breaks from work to meet for Starbucks. I rarely comment on blog posts, but after reading some of the amazing stories here, I felt compelled to share. As a 15 year partner, it’s often hard to describe to people outside Starbucks why I truly love the company. Why, as I’ve heard others say, I bleed green. This sharing of personal stories, of family, friends, struggles, & joy, of humanity on your blog is so akin to what I see everyday at work & why I’m proud to be a partner. What you’ve created here is a bit of the magic I’m lucky to be a part of. Melody, thank you for creating this venue for people to come together and share!! As for my own coffee story, I have a million. Here’s my favorite: when I was an SM, I had a handful of older gentlemen, all widowers, who visited my store everyday. One of my brilliant partners, Kimberly, decided to offer them a for here mug one morning since they always drank their coffee in the store. They were all thrilled but teased us one morning when we didn’t have enough clean mugs for them. “That’s my mug, why did you give it to someone else” We felt horrible but another idea began to form…what if they really DID have their own mugs at the store? My AM Shift Supervisor finally had it, we would go to a make your own pottery store & make them each a mug with their name on it. She was an artist and I had confidence they would be lovely. We spent our own money & had a great time painting their mugs. While we waited for the mugs to be done, it was hard to fight the anticipation of sharing what we had done. But we were good & kept quiet. The morning the gents came in & we handed their coffee over the counter in THEIR mugs was a day I’ll never forget. The look on their faces, of shock then gratitude, extreme gratitude was amazing to witness. At this busy, hectic coffee shop, they were special to us. Their tears and hugs said it all. I give ALL the credit to my partners, who just wanted to make “the guys” feel special. Thanks for letting me be a part of this and for allowing me to share my story. This thread is amazing. It should be required reading for new partners for an infusion of Starbucks culture – The comments are fantastic. Thank you everyone! There is still time if you want to write something to enter in for your chance to win. By the way, you don’t have to write something long and complex – I LOVE all the amazing stories, but you can write something short too, like about your first cup of Starbucks coffee. Thank you everyone. Sorry that I’m not reaching every person one by one, but there are so many great comments. All deserve a shout out. I honestly don’t remember what my first cup of Starbucks coffee, mostly because until I went to grad school I didn’t really drink coffee or live near Starbucks stores. I do remember why I love coffee shops and what got me hooked. I was unfortunately very sick during my first trip through grad school. I had never been a coffee drinker, and usually declined trips for coffee because I didn’t think I’d like anything. One night when I was feeling particularly crummy (i had a throat infection; not a nice simple strep that could be quickly cured… oh no… my throat had to be difficult), my fraternity brothers talked me into going to the local coffee shop with them. I was tired of being in bed, so I bundled up and ventured out into the cold, Iowa winter. Once we got there, I was thinking about a hot chocolate, but my friends talked me into a mocha instead. I watched the barista carefully craft my drink. He put latte art on top since he saw me watching, then added whipped cream, chocolate sauce, and chocolate shavings. It was wonderfully creamy, and the hot liquid felt wonderful on my sore throat. After that, I ended up visiting coffee shops much more often with my friends. It was a great place to study, and came with the benefit of wonderful, warm drinks on cold days. Wow, I don’t have such an interesting story as the ones above. I started going to Starbucks about 2 years ago because it’s sort of on the way home from the grocery store. I quickly became hooked and now it’s my weekly splurge. I loved reading all the stories! I remember my first cup from Starbucks, was after I graduated high school. I remember hanging out with one of my great friends, and going there for a Caramel Macchiato in the evenings. It was great hanging out with him, I hadn’t left for college yet, but my best friend had and it filled the void and brought us closer; as well as a little bit of peace before the big changes of moving away and going to college. Fast forward when I moved to Arizona, it was nice to still have some of the same comforts here. It brings some familiarity to a new city. That’s why I love Starbucks, it’s always welcoming and familiar no matter where you are! My first drink at Starbuck’s was a grande cappuccino in the Upper East Side of Manhattan. It’s memorable because it started a long love affair with coffee that has lasted for over 15 years. Nothing exciting as some of the other posts, but it did open a whole new culinary experience for me. Please email me for your prize! Melody @ StarbucksMelody dot com. The Venti extra hot soy chai latte hooked me on Starbucks for life.